This week marks the first full year of KristenShane.com! In August of last year, I was back home for a few weeks between the summer and fall semesters of my first year of college, and I was looking for a way to fill my time and help clear my mind. After thinking and praying about it, I hit “publish” on my very first post on August 12, 2016. Since then, this blog has been an answer to my prayers. Even after a full year, I still feel like I have so much to learn about the blogging world, but that’s so exciting to me. I love blogging because there’s always so much room to improve and grow, and I can’t wait to celebrate even more blog-iversaries and see where each year takes me. This week, I’m celebrating how far I’ve come (with my brand new, self-hosted site, post on this coming soon!) by hosting my first giveaway on my Instagram (open until noon EST on 8/9), and by enjoying some super cute cupcakes for my celebratory blog-birthday pictures. one cupcake just wasn’t enough! I’ll be starting a “Blogging for Beginners” series soon, starting with a post on my switch from WordPress.com to self-hosted. In the series, I’ll be sharing some of the tips and tricks I’ve learned in this first year. For now, I’d like to make some celebrations from my site so far! Views: I’ve talked about this before, but numbers are not what it’s all about for me. However, I believe in celebrating victories, big and small! Last August, my site had 20 total views (which is just fine!). In just the first week of this August, I’ve seen over 25x that, which is so exciting. Following: In January, I celebrated my first 50 followers. Since then, the Kristen Shane fam has grown exponentially. The growth is what I celebrate, each and every month. Social Media: I definitely underestimated the power of social media accounts for my blog. I didn’t start my Facebook page or Instagram for the first few months, but they’ve also seen steady growth, which I’m proud of. First post: From humble beginnings, right?! Read my very first post here. First guest post: The post I wrote for my sweet friend Kara’s site is easily one of my favorite, most personal posts to date. Read it here. Most views: They say you’ll never know which of your posts will be your big hits, which is totally true for me, too. This post has my most views ever, and has also been the most successful on Facebook. This post and this one follow closely for my most popular, so I’m celebrating all three. Best on Pinterest: This post was kind of my guinea pig for testing out “Pinterest strategy” to help improve traffic to my posts, and I still get daily views from a couple of the phone wallpapers I edited and pinned! I haven’t had any other pins with real traction so far, but this post gives me hope to keep trying my hand at pinning! First brand collab: This cute shirt was a glittery start to working with companies, and it helped me learn about building relationships and finding products that truly speak to “my brand” (which will always include all things pink and sparkly). Facebook Groups: Blog Facebook groups are wonderful assets for finding fellow bloggers and learning all there is to know about blogging. 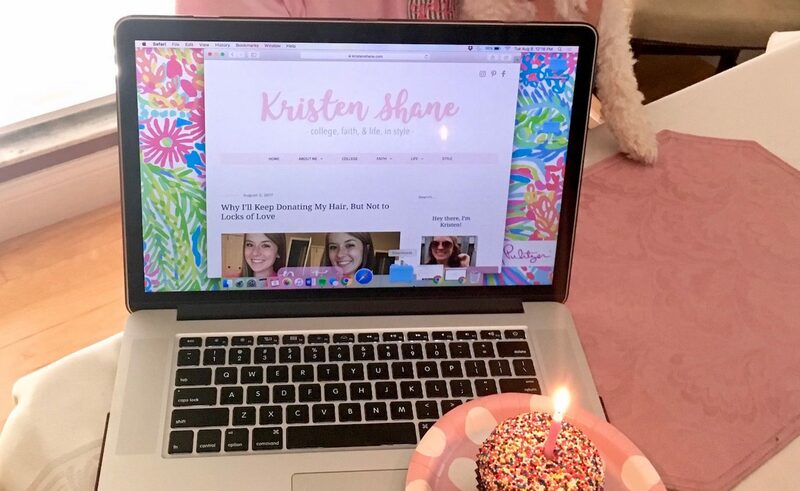 After joining a few great groups, I still couldn’t find a group of bloggers that were similar to me, so I decided to start my own group, and the Graced College Girl Blogger community was born. Blog Goals: I haven’t updated my goals post yet, but my honest-to-goodness main goal from the beginning has just been to grow honestly and be myself, simple as that. I’m taking “growth” as whatever it means for each season I’m in, and I’m just gonna keep doin’ my thing. I’d also like to celebrate you, my lovely friend, and whatever path brought you here. I like to think of my readers as friends of mine, and I’m thankful for each and every friend that finds their way to my rose-colored corner of the Internet. So thank you, for being you and being awesome, and for being a part of this beautiful world, which is a much better place with you in it. From here, I plan to keep celebrating my victories, appreciating the little things, blooming with grace, and posting about it all right here. Thanks for being here and celebrating this first year with me. Cheers! Congrats Kristen!! Also, can’t wait for that blogging series! I recently found your blog and I think is amazing! im a blogger in process! and i love to see how you can really it make something good and fun out of it!! Thanks girl!! I’m not sure how it works since I switched to self hosted, so if you could double check that you’re following “kristenshane.com” instead of “kristenshane.wordpress.com” that’d be great 🙂 just so you can be sure you’ll see my next posts!